A Parsi is well known for many things, the love for his car is one of many (usually his first car) and if you have no idea of what I write, imagine a freshly painted, new and shiny car all bells and whistles smiling at you as she leaves the showroom for the first time, seats all smelling great and new owner treating her like she's the most fragile thing on the planet, yeah you get the drift.... a Parsis car is slightly more shinier and well polished than the one that just rolled out of its mothers womb, I. kid. you. not! Now cars, evenings and wedding season aside a daily ritual in every Parsi house is evening tea time and however busy he or she may be, a cup of tea is always welcome and never forgotten. Now I must mention here that most of our clan prefer their tea brewed with some freshly cut lemon grass and a few sprigs of mint and the aroma that emanates from the kitchen could well be the stuff the harp carrying angels spray to keep the heavens smelling all nice and lovely. 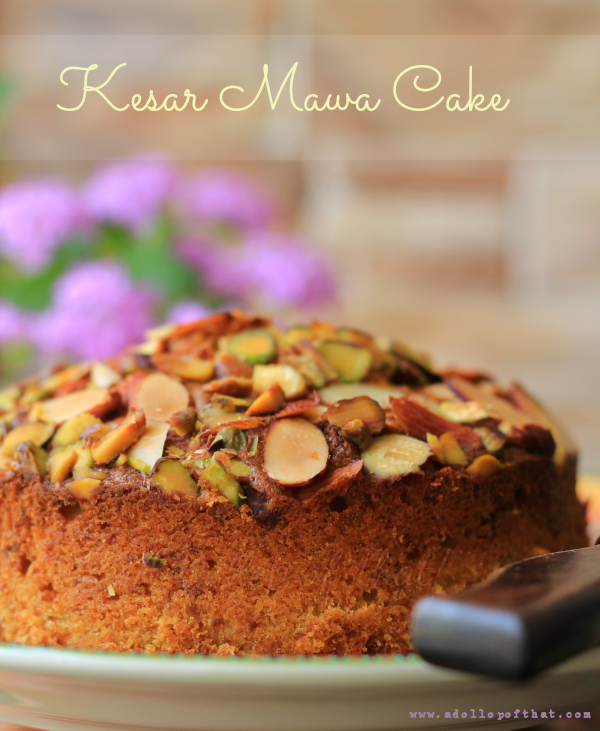 Now if you have no clue what a Mawa Cake is, have a look at my original Mawa Cake post here, if you do know what it is, then prepared to be taken to the next level of milky, caramel goodness that takes this iconic tea time buddy a notch higher with the inclusion of the Queen of spices - Saffron. 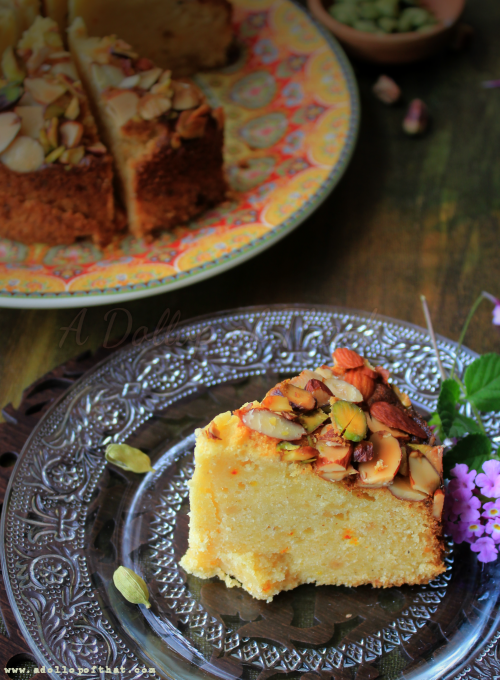 Lending the cake not only its beautiful pastel hue but also a heady aroma as it gleefully mingles with the mawa and cardamom. Orgasmic! Makes: One 9 inch cake or 12 cupcakes. 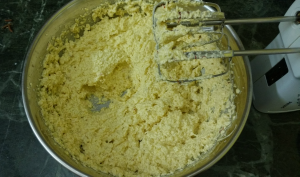 Keep aside the eggs, mawa, milk and vanilla. 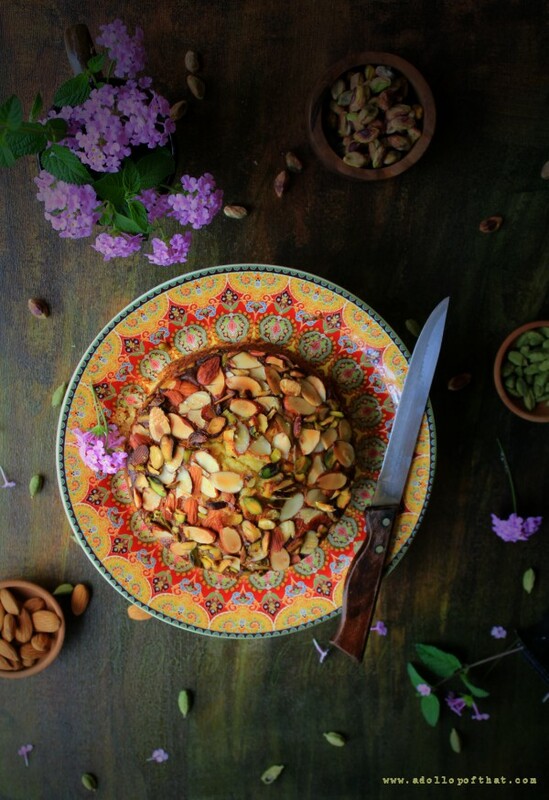 Warm a tbsp of the milk and soak in the saffron strands for 10 mins. Separate your wet and dry ingredients in two bowls. Whisk together all the dry ingredients so that they combine well. 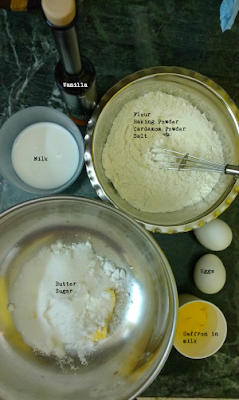 Whisk together the butter and sugar till the mixture is fluffy and pale in colour. 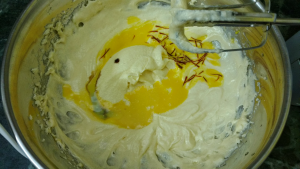 Now add in the saffron milk and whisk again. Next add in the mawa and vanilla and beat until well combined. Add in one egg at a time and incorporate well. 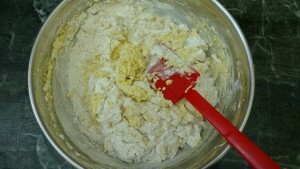 Now fold in all the dry ingredients gently with a spatula, combine into the wet mixture. 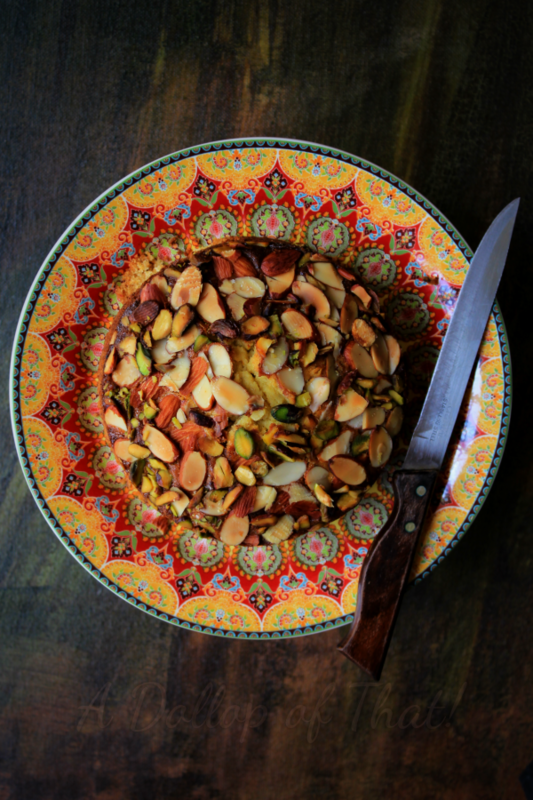 Cover the batter with slices of almonds and pistachios, gently press the nuts onto the surface, so that they do not fall off once baked. Bake in a preheated oven at 160 degrees Celcius for 60 mins or until a skewer inserted comes out clean. 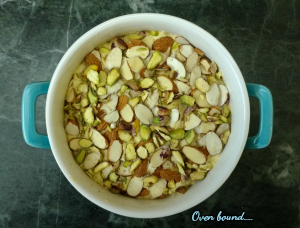 If you notice your nuts browning too much cove the top of your cake tine with aluminium foil.